For other uses, see Cacique (disambiguation). Look up cacique in Wiktionary, the free dictionary. Cacique comes from the Taíno word kassiquan, meaning "to keep house". In Taíno culture, the cacique rank was apparently established through democratic means. His importance in the tribe was determined by the size of his tribe rather than his skills in warfare since the Taínos were mostly a peaceable culture. They also enjoyed several privileges for their standing: they lived in a larger rectangular hut in the centre of the village, rather than the circular huts of other villagers, and they had a special sitting place for the areytos (ceremonial dances) and the ceremonial ball game. Spaniards extended the usage of cacique to refer to leaders at the town or village level in virtually all indigenous groups in Spanish America. Caribbean caciques who did not initially oppose the Spanish were co-opted into being intermediaries between the Spanish and their communities, but their cooperation was transitional and most revolted, resulting in their deaths in battle or by execution. Two famous early colonial-era caciques are Hatuey (Cuba) and Enriquillo (Hispaniola) who are now national heroes in Cuba and the Dominican Republic. At the base of the monument to Hatuey the historical plaque reads: "To the memory of Chief Hatuey, unforgettable native, precursor of the Cuban fight for freedom, he offered his life, glorifying his ideals while tormented by the flames on 2/2/1512. Monuments Delegation of Yara, 1999". Hatuey was a historical character in the 2010 film Even the Rain. In central Mexico in the colonial era, the Spanish more successfully utilized the leaders of the much more hierarchically organized indigenous peoples to function as intermediaries in the system of colonial rule. The hierarchy and nomenclature of indigenous leadership there might survive internally within communities, but the Spaniards' designation of caciques did not necessarily correspond to the hereditary indigenous system of leadership. Elite indigenous men willing to cooperate with the colonial rule replaced those with hereditary and traditional claims to leadership. The Spanish recognized the indigenous nobility as nobles within newly established colonial system, and caciques' status along with their families was reinforced by their being allowed to hold the Spanish noble honorific don and doña. Some caciques had entailed estates called cacicazgos. The records of many of these Mexican estates are held in the Mexican national archives in a section Vínculos ("entails"). The establishment of Spanish-style town government [cabildos] was used as a mechanism to replace traditional rule. Spanish manipulation of cabildo elections. In some areas the traditional, members hereditary lineages became office holders on the town councils. By the late colonial era in central Mexico, the term cacique had lost its dynastic meaning in many areas; "cacique status could in some degree buttress a family's prestige, but it could no longer in itself be regarded as a rank of major authority." In a 1769 appeal to the Viceroy of New Spain by a cacique family for restoration of its privileges, they were enumerated: that the cacique should be seated separately from commoners at public functions; he was excused from serving in town government; he was exempted from tribute and other exactions; he was excused from Sunday worship and payments of the half real; his servants were not liable for community labor; he was exempt from incarceration for debt and his property from sequestration; he could be imprisoned for serious crime but not jailed in the public jail; the caciques' names were to be listed among the nobles in official registers; and "all these privileges are to apply equally to the caciques' wives and widows." With Mexican independence in 1821, the special privileges of colonial-era caciques were abolished. In the Andean region the local term kuraka was used as an alternative to cacique, in contrast the rest of the Spanish Colonial Americas. After conquering the Inca Empire the Spaniards in the Peruvian viceroyalty had allowed the kurakas or caciques to maintain their titles of nobility and perquisites of local rule so long as they were loyal to the Spanish monarch. 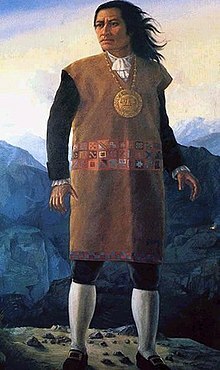 In the late eighteenth century, a massive uprising, the Tupac Amaru rebellion (1781), often called the "Great Rebellion", was led by Tupac Amaru II, a kuraka who claimed to be a descendant of the Inca royal line, namely to the last Emperor Thupaq Amaru. At independence in 1825, Simón Bolívar abolished noble titles, but the power and prestige of the kurakas was already in decline following the Great Rebellion. Kuraka rebellions were made since the beginning of the Spanish colonial rule, kurakas from different backgrounds and places of the Andes led uprisings on multiple occasions, being the Tupac Amaru II rebellion, which came after 250 years of colonial rule, the largest of them and the major rebellion in the history of Spain's American empire, nevertheless kuraka revolts would continue years and decades after Tupac Amaru II's uprising such as the Tupac Katari uprising or the Mateo Pumakawa insurrection made during the South American Wars of Independence. An extension of the term cacique, Caciquismo ("boss rule") can refer to a political system dominated by the power of local political bosses, the caciques. In the post-independence period in Mexico, the term retained its meaning of "indigenous" leaders, but also took on a more general usage of a "local" or "regional" leader as well. Some scholars make a distinction between caudillos (political strongmen) and their rule, caudillismo, and caciques and caciquismo. One Argentine intellectual, Carlos Octavio Bunge viewed caciquismo as emerging from anarchy and political disruption and then evolving into a "pacific" form of "civilized caciquismo", such as Mexico's Porfirio Díaz (r. 1876-1911). Argentine writer Fernando N.A. Cuevillas views caciquismo as being "nothing more than a special brand of tyrant". In Spain, caciquismo appeared in late 19th-century Spain and early 20th-century. Writer Ramón Akal González views Galicia in northwest of Spain, as having remained in a continual state of strangulated growth over centuries as a result of caciquismo and nepotism. "Galicia still suffers from this anachronistic caste of caciques." Spanish strongman El Caudillo Francisco Franco (1892-1975) was born in Ferrol in Galicia. In the Philippines, the term cacique democracy was coined by Benedict Anderson. It has been used to describe the political system where in many parts of the country local leaders remain very strong, with almost warlord-type powers. The Philippines was a colony of Spain from the late sixteenth century until the Spanish–American War of 1898, when the United States assumed control. The U.S. administration subsequently introduced many commercial, political and administrative reforms. They were sometimes quite progressive and directed towards the modernization of government and commerce in the Philippines. However, the local traditional Filipino elites, being better educated and better connected than much of the local population, were often able to take advantage of the changes to bolster their positions. There is no consensus in the scholarly literature about the origins of caciquismo. Murdo J. MacLeod suggests that the terms cacique and caudillo "either require further scrutiny or, perhaps, they have become so stretched by the diversity of explanations and processes packed into them that they have become somewhat empty generalizations". Gregor MacGregor, he claimed to be cacique of Poyais, a fictional Central American country. Abercrombie, Thomas A. "Tributes to Bad Conscience: Charity, Restitution, and Inheritance in Cacique and Encomendero Testaments of Sixteenth-Century Charcas" in Dead Giveaways: Indigenous Testaments of Colonial Mesoamerica and the Andes, Susan Kellogg and Matthew Restall, eds. Salt Lake City: University of Utah Press 1998, pp. 249–289. Bartra, Roger et al.,Caciquismo y poder político en el México rural. 8th ed. Mexico: Siglo Veintiuno Editores, 1986. Caciquismo in twen[t]ieth-century Mexico. London: Institute for the Study of the Americas, 2005. Chance, John K. (1996) "The Caciques of Tecali: Class and Ethnic Identity in Late Colonial Mexico." Hispanic American Historical Review 76(3):475-502. Chance, John K.(1998) "La hacienda de los Santiago en Tecali, Puebla: Un cacicazgo naua colonial, 1520-1750." Historia Mexicana 47(4):689-734. Costa y Martínez, Joaquín, Oligarquía y caciquismo: como la forma actual de gobierno en España, urgencia y modo de cambiarla. Zaragoza: Guara Editorial, 1982. Costa y Martínez, Joaquín, Oligarquía y caciquismo: colectivismo agrario y otros escritos (antología). Madrid : Alianza Editorial, c1967. de la Peña, Guillermo. "Poder local, poder regional: perspectivas socio-antropológica." In Poder local: poder region, Eds. Jorge Padua and Alain Vanneph. Mexico City: Colegio de México-CEMCA 1986..
Díaz Rementería, Carlos J. El cacique en el virreinato del Perú: estudio histórico-jurídico. Sevilla: Universidad de Sevilla, 1977. Dutt, Rajehwari. Maya Caciques in Early National Yucatán. Norman: University of Oklahoma Press 2017. Falcón, Romana. Revolución y caciquismo: San Luis Potosí, 1910-1938. México, D.F. : Centro de Estudios Históricos, Colegio de México, 1984. Fernández de Recas, Guillermo S., Cacicazgos y nobiliario indígena de la Nueva España. México : 351 pp. Serie: Instituto Bibliográfico Mexicano. Publicación 1961. Friedrich, Paul. "The Legitimacy of a Cacique". In Local-Level Politics: Social and Cultural Perspectives, ed. by Marc J. Swartz. Chicago: Aldine 1968. Gibson, Charles. "The Aztec aristocracy in colonial Mexico." Comparative Studies in Society and History 2, no. 2 (1960): 169-196. Girón, Nicole. Heraclio Bernal, bandolero, cacique o precursor de la Revolución?. México : Instituto Nacional de Antropología e Historia, SEP, Departamento de Investigaciones Históricas, 1976. Heine, Jorge. The last cacique: leadership and politics in a Puerto Rican city. Pittsburgh: University of Pittsburgh Press, 1993. Hoekstra, Rik. 2010. "A Colonial Cacicazgo: The Mendozas of Seventeenth-Century Tepexi de la Seda." European Review of Latin American and Caribbean Studies 89:87-106. MacLeod, Murdo J., "Cacique, Caciquismo" in Encyclopedia of Latin American History and Culture, vol. 1, pp. 505–06. New York: Charles Scribner's Sons 1996. Martínez Assad, Carlos, ed. Estadistas, caciques, y caudillos. Mexico City: UNAM-IIS 1998. Menengus Borneman, Margarita and Rodolfo Aguierre Salvador eds. El Cacicazgo en Nueva España. Mexico: UNAM - Plaza y Valdés 2005. Ouweneel, Arij. 1995. "From Tlahtocayotl to Governadoryotl: A Critical Examination of Indigenous Rule in 18th-century Central Mexico." American Ethnologist 22(4):756-85. Ramírez, Susan, "The 'Dueños de Indios': Thoughts on the Consequences of the Shifting Bases of Power of the 'Curaca de los Viejos' Under the Spanish in Sixteenth-Century Peru," Hispanic American Historical Review 67, no. 4 (1987):575-610. Salmerón Castro, Fernando. "Caciquismo" in Encyclopedia of Mexico, vol. 1, pp. 177-179. Chicago: Fitzroy Dearborn 1997. Spores, Ronald. "Mixteca cacicas: Status, wealth, and the political accommodations of the native elite women in early colonial Oaxaca" in Indian Women of Early Mexico, ed. Susan Schroeder et al. Norman: University of Oklahoma Press 1997. Tusell, Javier, Oligarquía y caciquismo en Andalucía (1890-1923). Barcelona : Editorial Planeta, 1976. Villella, Peter B. "“Pure and Noble Indians, Untainted by Inferior Idolatrous Races”: Native Elites and the Discourse of Blood Purity in Late Colonial Mexico." Hispanic American Historical Review 91, no. 4 (2011): 633-663. Wasserman, Mark, Capitalists, caciques, and revolution: the native elite and foreign enterprise in Chihuahua, Mexico, 1854-1911. Chapel Hill: University of North Carolina Press, 1984. Wilson, Samuel M. Hispaniola: Caribbean Chiefdoms in the Age of Columbus. 1990. Wood, Stephanie. "Testaments and Títulos: Conflict and Coincidence of Cacique and Community Interests in Central Mexico" in Dead Giveaways: Indigenous Testaments of Colonial Mesoamerica and the Andes, Susan Kellogg and Matthew Restall, eds. Salt Lake City: University of Utah Press 1998, pp. 85–111. Zeitlin, Judith Francis, and Lillian Thomas. "Spanish justice and the Indian cacique: disjunctive political systems in sixteenth-century Tehuantepec." Ethnohistory (1992): 285-315. ^ The Catastrophe of Modernity: Tragedy and the Nation in Latin American Literature. Bucknell University Press. 2004. pp. 136–. ISBN 978-0-8387-5561-7. Retrieved 25 June 2013. ^ "Taíno Indians Culture". Topuertorico.org. Retrieved 2012-06-19. ^ Murdo J. MacLeod, "Cacique, Caciquismo" in Encyclopedia of Latin American History and Culture. Vol. 1, p. 505. New York: Charles Scribner's Sons 1996. ^ MacLeod, "Caciques, Caciquismo", p. 505. ^ Ida Altman, "The Revolt of Enriquillo and the Historiography of Early Spanish America," The Americas vol. 63(4)2007, 587-614. ^ Charles Gibson, The Aztecs Under Spanish Rule: A History of the Indians of the Valley of Mexico, 1519-1810, Stanford: Stanford University Press 1964, p. 36. ^ Guillermo S. Fernández de Recas, Cacicazgos y Nobiliario Indígena de la Nueva España, Mexico: Biblioteca Nacional de México, 1961. ^ S.L. Cline, "A Cacicazgo in the seventeenth century: The case of Xochimilco" in Land and Politics in the Valley of Mexico: A two-thousand-year perspective. Ed. H.R. Harvey. Albuquerque: University of New Mexico Press 1991. ^ Guido Münch, El cacicazgo de San Juan Teotihuacan durante la colonia, 1521-1821. Mexico City: SEP, Instituto Nacional de Antropología e Historia, Centro de Investigaciones Superiores 1976. ^ Robert Haskett, Indigenous Rulers: An Ethnohistory of Town Government in Colonial Cuernavaca. Albuquerque: University of New Mexico Press 1991. ^ MacLeod, "Cacique, Caciquismo", p. 505. ^ Gibson, The Aztecs Under Spanish Rule, p. 163. ^ Gibson, "The Aztecs Under Spanish Rule," pp. 164-65. ^ Cecilia Méndez, The Plebeian Republic: The Huanta Rebellion and the Making of the Peruvian State. Durham: Duke University Press 2005, pp. 102-05. ^ Walker, Charles F. (2015). La rebelión de Tupac Amaru (in Spanish). IEP. ISBN 9789972515408. ^ John Lynch, Caudillos in Spanish America: 1800-1850. Oxford: Clarendon Press 1992, p.6. ^ Mark Wasserman, Capitalists, caciques, and revolution: the native elite and foreign enterprise in Chihuahua, Mexico, 1854-1911. Chapel Hill: University of North Carolina Press, 1984. ^ Fernando Díaz Díaz, Caudillos y caciques: Antonio López de Santa Anna y Juan Álvarez. Mexico, 1972, 3-5. ^ Carlos Octavio Bunge, "Caciquismo in Our America" (1918), in Hugh M. Hamill, ed. Caudillos: Dictators in Spanish America. Norman: University of Oklahoma Press 1992, p. 172. ^ Fernando N.A. Cuevillas, "A Case for Caudillaje and Juan Perón" in Hugh M. Hamill, ed. Caudillos, p. 287. ^ Varela Ortega, José (2001). El poder de la influencia: Geografía del caciquismo en España: (1875–1923). Centro de Estudios Políticos y Constitucionales. ISBN 978-84-259-1152-1. ^ Ramón Akal González, Obra Completa II, 1977, p. 111.